Looser than La Trouée (1962–63) and as dynamic as Southern (1963), Big Freeze / Le grand gel is composed around a system of T-shaped coloured planes and zigzags, through which pictorial layers move freely either in front of or behind the edges of the predominant rectangle – an analogy to the window that both contains and excludes the landscape. As a site of transitions, signs, and winding traces, the pictorial space is like a trap filled with misleading reflections and secret exits. Each brushstroke generates an open response to plasticity, a new definition of painting. 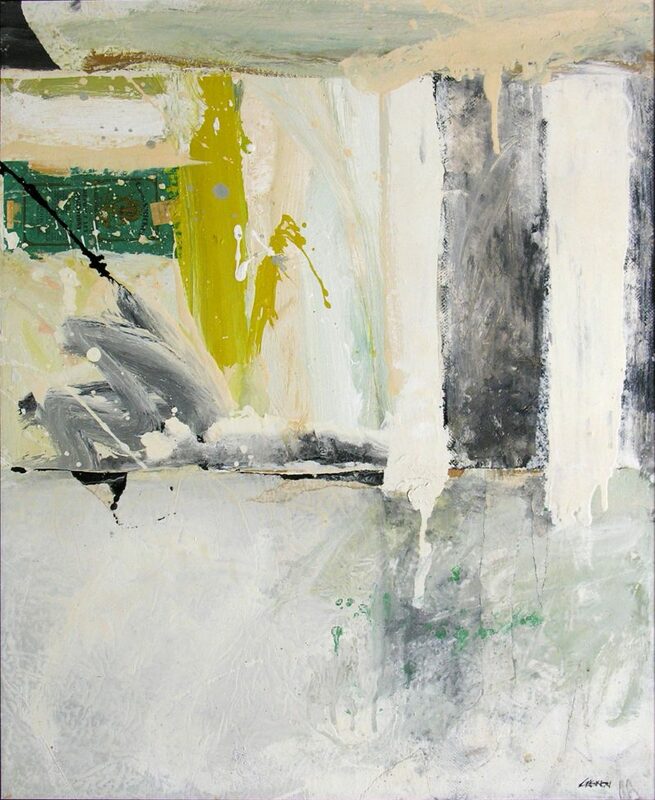 Fry further notes, “As a result, the space seems to move, to open and rebuild itself as the eye finds its landmarks.” Thus, the painting becomes a tour de force charged with the artist’s undeniable photographic vision that forever tracks and frames its material subject. Charles Gagnon was born in Montreal in 1934. He completed his studies in the U.S. between 1955 and 1959 at the New York Institute of Photography and the New School of Interior Design. 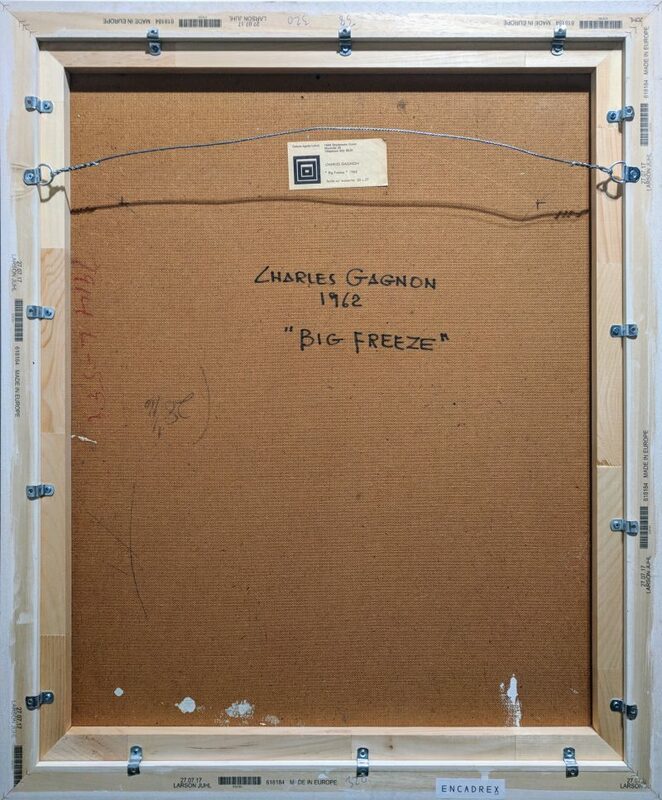 Gagnon became known as much abroad as in Canada through his participation in important exhibitions, such as ART: USA: 58, at Madison Square Gardens in New York; in the early 1960s at the Galerie Denyse Delrue, in Montreal; and the Deuxième Biennale de Paris at the Musée d’art modern. Following these successes were photographic exhibitions at the Vancouver Art Gallery, in 1971, and at New York’s International Center of Photography, in 1983. Gagnon taught at Concordia University in Montreal (1967–75) and at the University of Ottawa (1975–96). He received the Banff School of Fine Arts Prize (1981), the Prix Paul‑Émile-Borduas (1995), the Governor General’s Award in Visual and Media Arts (2002), and the Jean Paul Riopelle Career Grant (2003). His work was the subject of a major retrospective at the Musée d’art contemporain de Montréal, in 2001, two years before his death. FRY, Philip. Charles Gagnon, Montréal, Musée des beaux-arts de Montréal, 1978. MARTIN, Michel, et Roald NASGAARD. Les Plasticiens et les années 1950/60, Québec, Musée national des beaux-arts du Québec, 2013.